Background: A heterocyclic compound containing Nitrogen linkage attracts interest in its synthesis in which cyclization reaction is conducted using suitable linear compounds. These compounds reported having biological effects such as anti-tumor, antibacterial, antidepressant, analgesic and antiviral activities. An efficient One-Pot protocol for the synthesis of 5-amino-1H-pyrazole-4- carbonitrile and its derivative using aromatic aldehyde, malononitrile, phenylhydrazine and Mg-Fe hydrotalcite as a heterogeneous catalyst at ambient temperature. Hydrotalcite also known as layer double hydroxide has a layer structure in which anionic species such as carbonate and hydroxide located in the interlayer region, has been reported as drug delivery agent, ion - exchanger and catalyst. Methods: Catalyst synthesized by co-precipitation method and characterization of catalyst carried out using an analytical technique such as XRD, TGA and SEM. The catalyst is used for the synthesis of substituted 5-amino-1H-pyrazole-4-carbonitrile heterocyclic moieties. Molecules are characterized using 1H NMR and 13C NMR. Results: Hydrotalcite of the various molar ratio of Mg/Fe was synthesize and screen for reaction. Catalyst characterization was done using XRD and TGA matched with the reported literature. Solvent, catalyst quantity and catalyst reusability also screen for reaction. Basicity study was done as per literature survey (Hammet indicator method). One pot methodology of synthesis applies for all substituted organic molecules. Conclusion: The calcined Mg-Fe hydrotalcite with a molar ratio of 3:1 derived from calcinations was found to be the suitable catalyst that gives the highest basicity and best catalytic activity. This procedure offers several advantages over reported methods including shorter reaction time, high yield and simple work-up procedure. 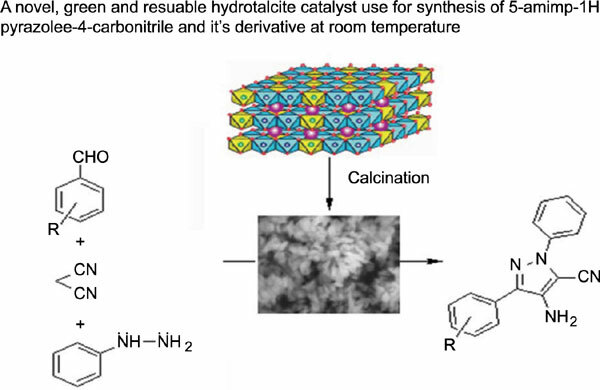 Calcined hydrotalcite was found to be an effective catalyst for the synthesis of 5-amino-1H-pyrazole-4-carbonitrile and its derivatives at room temperature conditions. The catalytic activities of the calcined hydrotalcite show a striking correlation with their corresponding basic properties. This process has an advantage over the other reported methodology such as Non-toxic, reusable catalyst, convenient and cost-effective. Aromatic aldehyde, heterogeneous catalyst, hydrotalcite, knovengel, multicomponent, pyrazole.